High quality mirror polished stainless steel handle and blade holder, fitted with positive lock to prevent folding whilst in use. Spring loaded multi-switch releases blade holder from handle when folded and operates quick change mechanism for easy blade removal/fitting - no tools required. Includes belt clip. 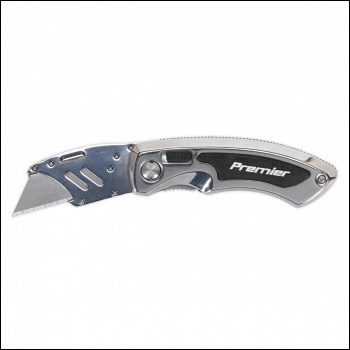 Supplied with six reversible high carbon steel blades. High quality mirror polished stainless steel handle and blade holder fitted with positive lock to prevent folding whilst in use. Spring loaded multi-switch releases blade holder from handle when folded and operates quick change mechanism for easy blade removal/fitting - no tools required. 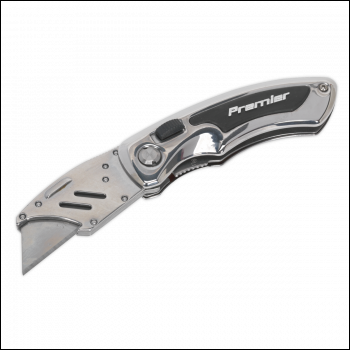 Supplied with six reversible high carbon steel blades.